How a group of alums came together to disrupt common practices and create paths to equity in the classroom. Note: A version of this story originally appeared on the Ed.L.D. Impact website. After six years of running her own tutoring and test preparation program, No Dreams Deferred, Darnisa Amante, Ed.L.D. '16 (pictured, left), realized she was not achieving her mission for improving outcomes for black and brown children. So, she left her position as chief executive officer and lead tutor to become a long-term substitute teacher in the New York City Public Schools, hoping to have a greater impact on the academic performance of students of color. Unfortunately, this new experience was not what she had envisioned. Instead of using her experience to address the persistent achievement gaps between black and white students, Amante was directed to hold students back a year when they couldn’t meet standards academically. Amante regrouped once again and applied to the Doctor of Education Leadership (Ed.L.D.) Program at the Harvard Graduate School of Education. 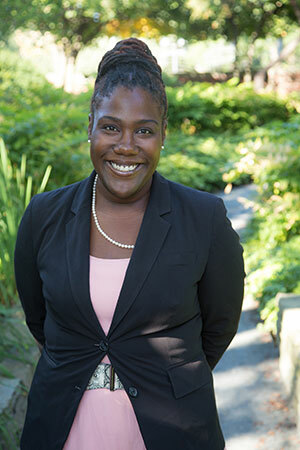 After graduation, she launched The Disruptive Equity Education Project (DEEP), a hybrid nonprofit/for profit organization, focused on building collaborative teams to tackle the complexities of race, equity, and equality. Since Amante and fellow co-founders, Daisy Han and Elizabeth Albany, both Ed.M. '17, launched DEEP seven months ago, they have worked with over 4,000 people including teams from nonprofit organizations, system leaders, teachers, parents, and students. Here, Amante discusses the importance of equity in education and how DEEP is going to help schools and systems achieve it. What does equity mean to you? Equity is giving people what they need because they deserve it. In 2010, I was being interviewed for the documentary, Tested, and was questioned about what it was like owning a tutoring and test prep business that was largely solicited by upper-middle-class families. I never considered how things had changed over the years. I started a business to help black and brown children achieve every dream they wanted through education, but [six years later] every one of my clients was white. I had to dissolve it. Though I cared for my students and their families deeply, I couldn’t stand by it. That made me start to think about race and equity, which families were paying for my business and how much parents were willing to pay. How does that apply to your work at the Disruptive Equity Education Project (DEEP)? We developed a framework that takes leaders through six key stages of equity work through workshops, interactive experiences, and reflective discourse. During the first part, [we concentrate on helping] people tell their story and to unpack and understand who they are. The other part is supporting districts and operationalizing equity. The entire framework is centered around hope. I want to inspire people to think beyond the present context and have a plan for how to get there. There are many organizations that help people have the conversation [around race and equity], but I find that it’s hard for superintendents and principals to think about what happens next. How do they pace this work? When do they bring teachers in? When do they bring students and parents in? How can they communicate something that might be really contentious without losing their job or leave teachers feeling like they will lose their jobs? If we have conversations at scale about what our biases do to black and brown children and how these biases show up in our classrooms, then we will have students who believe they have a right to be something. How does the process work? The first part of our framework is called the “Reckoning.” Every district or organization and individual has to have a reckoning moment. [I like to think] about that approach as the window versus the mirror. [A majority of people] are ready to externalize the situation [by] looking out “the window” of race and equity. It is only when you hold up the “mirror” that they are [confronted] with their own assumptions and biases. The Reckoning is building collective empathy to understand the perspectives of people and to meet them where they are. We then move into “Narratives.” This requires people to detail their experiences of inequity. Using a storytelling framework, we help them to develop that story and to share with one another as a whole group. “Inner work” is the third frame. This is the deepest [part of our] framework because it requires individuals to unpack their assumptions and biases. [We ask participants to] partner with others in an interactive experience to test their assumptions. [We provide them with] protocols and an equity taxonomy about best practices and how to use them. After that is “Critical Race Theories.” This phase introduces participants with a framework to make sense of inequity as it exists today. We prepare the audience to discuss ways to bring the learning back into the larger community to make lasting change. The next frame is “Transformative Culture.” For organizations, this results in creating a mission and vision statement around equity. Finally, the last frame is “Building Capacity.” I believe that if the Disrupting Education Equity Project does its job well then it will build the capacity of others to teach other people. As you continue this work, what do you want people to know about you? I feel as though my second calling is being an equity coach and consultant. I realized very quickly that I was not called to children, but to the adults who work on behalf of children. I knew that if I wanted to work with adults then I needed to know how adults think and behave. I knew that my experiences as a teacher taught me that you couldn’t change someone working in a silo. My grade-level team would have all of these amazing experiences but then across the entire school it was very different. I wondered how I could change the culture of the whole building so what I had with my grade-level team could permeate throughout. The big bulk of my work is taking people through a tunnel they didn’t expect had light on the other side. I need to convince them that going through the tunnel is worth it because on the other side of that tunnel is the betterment of a community that they may not look like, live around, or interact with outside of work. Ultimately, we are all part of the problem and solution, but we need adults who feel capable of moving children forward. This next iteration of my work calls me to help adults so that they can be better advocates for children.